Scale 1/24. All 4 doors open ( front doors don't open far ). opening bonnet with detailed engine, the front wheels steer and all roll, drop down luggage rack. opening boot / trunk even has the mascot on the radiator grill ( always missing ). A Franklin mint scale model car of a 1955 Rolls Royce Silver Cloud 1. The roof aerial is missing as usual. Very well detailed has opening bonnet with detailed engine, opening doors, opening trunk, front wheels steer and roll. Scale is 1/24. no box / no paper work. 1/24 Scale Diecast Model by Franklin Mint. Material Diecast. Scale 1/24. MINT - The item is in perfect condition. GOOD - The item will have had more use, showing obvious imperfections. EXCELLENT - The item will have had very careful use, with only small imperfections. The seats have gone very slightly yellow with age, no box or paperwork. near mint condition, ( pre owned ) no box loose. Roof and the tyres are a little grubby, could do with a gentle clean. Scale is 1/24. No box / no paper work. Very well detailed, has opening bonnet with detailed engine, opening doors, opening rumble seat, The front wheels steer and roll. 1/43 Scale Diecast Model by Franklin Mint. Scale 1/43. MINT - The item is in perfect condition. The MODEL is in the following condition - EXCELLENT - previously displayed. The BOX is in the following condition - GOOD - worn. 1967 CHEVROLET CORVETTE. BY FRANKLIN MINT. 1/24TH SCALE. 1961 LINCOLN CONTINENTAL. FRANKLIN MINT 1/43RD SCALE. CLASSIC CARS OF THE 60's. THIS MODEL HAS NO BOX. A Franklin mint scale model of a 1946 Chevrolet Suburban with canoe and camping gear. Very well detailed has opening bonnet with detailed engine, opening doors, opening boot / trunk, The front wheels steer and roll. Scale is 1/24. No box / no paper work. As GSP are rough with parcels. Very well detailed has opening doors, bonnet with detailed engine, opening boot / trunk, front wheels steer and roll. the roof aerial is missing and mascot. Scale is 1/24. A Franklin mint scale model of a 1961 Jaguar XKE / E Type. hard top. Very well detailed, has opening doors, bucket seats, opening bonnet with detailed engine, opening rear door. the front wheels steer and all roll. Sent second class, sign for. scale is 1/24. ( pre owned ). If you can't see it in the photo it's not included. All these model is listed are pre owned. no paper work.
. limited to 800. Scale is 1/24. Very well detailed has opening doors, opening bonnet with detailed engine, front wheels steer and roll. drop down luggage rack. 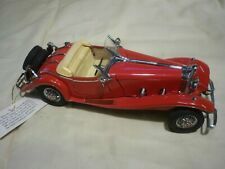 Franklin Mint 1/24th Scale 1948 MG TC Sports Car. Condition Mint and Complete. Original Box and Paperwork. Well detailed, opening doors, bonnet with detailed engine, front wheels steer, and roll. lift off roof, hood up and hood down. sent second class, sign for. scale is 1/24. ( pre owned ). If you can't see it in the photo it's not included. Prices vary, but tend to range from £8 to £18 depending on weight and size of the item. Outside of the UK. Within the UK. Scale is 1/24. no box / no paper work. Very well detailed has opening bonnet with detailed engine, the front wheels steer and roll. As GSP are rough with parcels. A little dust in the hard to reach corners. Franklin Mint Car 1959 Cadillac Eldorado Biarritz. 1:24 Great condition. Has been kept in the display case since bought. Any questions or further pictures please ask. Dispatched with Insurance and recorded delivery. A Franklin mint model of a 1930 Al Capone's V16 LWB Cadillac imperial sedan. drop down luggage rack, Hat, brief case, Tommy gun, all never opened. 1/ Scale Model by FRANKLIN MINT. MINT - The item is in perfect condition. SPARES or REPAIR - The item will be in a poor condition. The RM Toys Team. Kind Regards. Add to Favourites. Our aim is to ensure no matter what the model, we will provide an excellent service experience. Here I have a Volkswagen New Beetle Millennium Edition model made by Franklin Mint. Collections bought top prices paid. Limited edition No 3934 of 7500. Diecast precision model in a scale of 1:24. Features opening doors, bonnet, fuel cap and boot with working steering. A Franklin mint scale model of a 1938 Alvis 4.3 litre. Very well detailed has opening doors, opening bonnet with detailed engine, opening boot, the front wheels steer and all roll, lift off plastic hood ( up ) missing mascot and no fold down hood. 1/43 Scale Diecast Model by Franklin Mint. Scale 1/43. SPARES or REPAIR - The item will be in a poor condition. MINT - The item is in perfect condition. Ending Soon. New Arrivals. The RM Toys Team. Well detailed, opening bonnet with detailed engine, opening doors, opening rumble seat, the front wheels steer and roll. the seats have changed colour with the sun light. beautiful paint work. Scale is 1/24. Scale is 1/24. Cash on collection. 1/24 Scale Diecast Model by Franklin Mint. Scale 1/24. MINT - The item is in perfect condition. The MODEL is in the following condition - EXCELLENT - Paint on rear has bubbled very slightly. 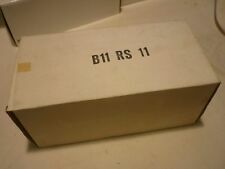 The BOX is in the following condition - EXCELLENT- Slight wear - Plain white. Sent second class, sign for. scale is 1/24. If you can't see it in the photo it's not included. tonneau cover is faded, see photo. ( this item is pre owned ). All these model is listed are pre owned. YOU ARE BUYING A RARE HIGH QUALITY AND REALISTIC DIECAST MODEL FEATURING A CLASSIC GARY COOPER DUESENBERG J DIECAST CAR. A VERY SCARCE SPECIAL EDITION MODEL MADE BY FRANKLIN MINT. Scale is 1/ 24. This model hasopening doors, opening bonnet with highly detailed engine, travel rug, The front wheels steer and all roll. A Franklin mint model of a 1961 E Type Jaguar. This model was bought new from Franklin mint and has lived in it's box ever since. sent second class, sign for. Scale is 1/24. Well detailed, opening bonnet with detailed engine, opening doors, opening boot / trunk, front wheels steer and roll. YOU ARE BUYING A RARE HIGH QUALITY AND REALISTIC DIECAST MODEL FEATURING A CLASSIC 1930 DUESENBERG J DERHAM TOURSTER MAROON DIECAST CAR. A VERY SCARCE SPECIAL EDITION MODEL MADE BY FRANKLIN MINT. THIS 1.24 SCALE DIE-CAST REPLICA,THIS MODEL IS ASSEMBLED AND FINISHED BY HAND. A Franklin mint scale model of a 1985 Lamborghini countach. Scale is 1/24. Cash on collection. This item is pre owned.